This week I’m introducing mystery thriller writer Carl Rackman. He’s the author of Irex and Voyager, both of which can be found on Amazon. If you’re a fan of Clive Cussler or Robert B. Parker, you’re sure to love these as well. 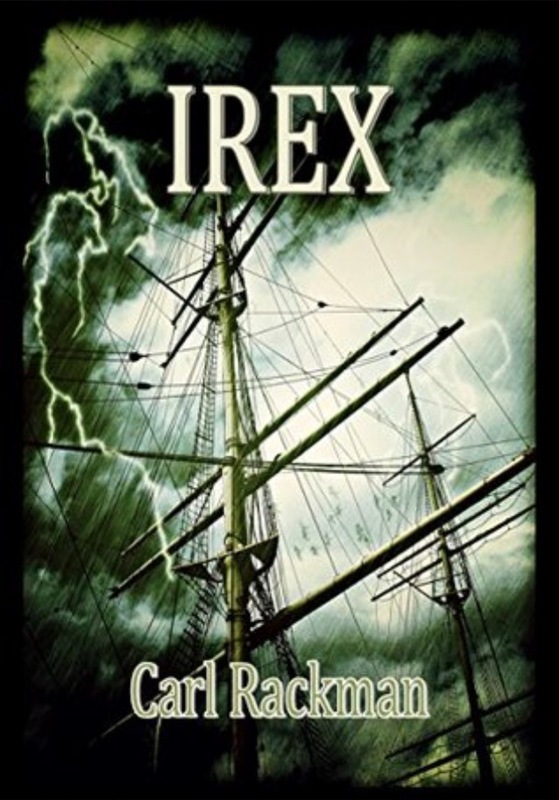 In the harsh winter of December 1889, the sailing vessel Irex leaves Scotland, bound for Rio de Janeiro. She carries three thousand tons of pig iron and just three passengers for what should be a routine voyage. But Captain Will Hutton soon discovers that one of his passengers hides a horrifying secret that threatens the lives of everyone on board. I’m Carl, which is a pen name (Carl is actually my brother’s name!) I’d rather be known as Carl Rackman to the outside world. I’m British and live in Southern England. I used to be an airline pilot and flew professionally for 15 years – I’ve been to every continent except Antarctica! I had to stop flying two years ago when a mystery virus damaged a nerve in my inner ear. I began to lose my balance and become disorientated. For almost two years it kept recurring; for long periods I was housebound, couldn’t drive, couldn’t socialise or even speak on the phone for more than about 20 minutes. It was a genuinely crushing personal experience. But from that low I began to write, and have since realised I have a great passion for creative writing and have almost finished my third novel in a year. I’ve always loved reading. I learned to read very early as a young child, so I’m told, and used to devour any story. My Mum would read bedtime stories most nights (if she wasn’t working) and as I got older I read some of the classic British children’s fare: Roald Dahl’s stories, Hugh Lofting’s Doctor Dolittle books, Norman Hunter’s Professor Branestawn. Who doesn’t love Roald Dahl and Doctor Dolittle? My absolute favourite books as a child were Willard Price’s Adventure series, about two American teenage brothers whose dad ran an animal centre for exotic animals. They went around the world capturing rare and amazing animals for the world’s zoos, while having some hair-raising and quite brutal adventures along the way. It was so un-PC by today’s standards but they were my Harry Potter! The book that changed me the most has to be (cliché alert!) the New Testament of the Bible. It’s funny how people don’t regard religion as anything much when they have control and mastery of their lives, the way I did for decades. Then the world flips you upside down, everything you knew changes, and you have to make a radical reassessment of your entire self and your values. It literally changed everything about my life: the way I see the world, the things I care about, and the way I choose to express myself in relationships. The “normal” book that changed me was Kurt Vonnegut’s Breakfast Of Champions. It was the first book I’d read to make me realise that the message of a book didn’t have to have anything to do with the story. To my 15-yo self, it was the most amazing, original and worldview-changing thing I’d ever seen. I had a similar feeling reading JD Salinger’s Catcher In The Rye as a college student, and again when I read Anthony Burgess’ A Clockwork Orange. Last book I read was Neil Gaiman’s Neverwhere, a wonderfully-written, imaginative urban fantasy set in London, which was my home for years. It wasn’t all good, but I loved the writing. My reigning favourite book is Bluebeard by Kurt Vonnegut Jr. I could feel almost every fibre of the main character Rabo Karabekian. Great thought to remember! Even Kurt Vonnegut Jr. was once an amateur. When I recovered from my illness and realised I would rather write than fly planes. I used to write creative stories for homework in primary school. One was about a nightmare and it got submitted to a national competition. I obviously didn’t win or I would have heard something. But it was framed outside the headteacher’s office for the rest of the year! That’s still great encouragement for a youngster! The most difficult part of my writing journey has been other people. Their sympathetic but glassy-eyed lack of understanding has caused me more self-doubt and angst than anything to do with actual writing. The best part of my writing journey has been other people. Their support, love and incredulity on reading the finished product (“I can’t believe you wrote this!”) has brought me more pleasure and self-worth than anything to do with actual writing. My father-in-law said to me, “You should write. I think you’ve got a book inside you.” He was right. As a self-published author, the best piece of advice I received was “Get an editor. You can’t do it on your own. Unless you want to do it badly.” They were right too. It must have worked because your writing is impressive. My 75% finished work in progress is called “Jonah”, a claustrophobic mystery/thriller set on a WW2 destroyer in the Pacific. The main character is a young sailor who was the sole survivor of a deadly kamikaze attack. Not only that, he was completely unscathed even though everyone else around him was killed. He already has a reputation for being lucky, but now he is ostracised and bullied by others afraid of the circumstances of his escape. The crippled ship must sail alone back to the West Coast, but on the way home the crew are beset by visions and hallucinations, especially of a sea monster that threatens to pick them off one by one. Our ‘lucky’ MC is the only one unaffected, and he begins to incur the animosity of the others as they suspect him as the cause of their misfortune. I build scale models of aircraft and ships. I build to a very high standard and have won several awards for my work, and made some good money from building commissions and selling my finished models. Like writing, it’s a great blend of research, creativity and skill. Unlike writing, I’ve actually made some money from it! For you readers, I’ve seen pics and he’s talented. Really talented. Espionage. I’ve always wanted to be an intelligence agent. I’ve made several applications to the security services in my life, though that would be telling. French Polynesia (Tahiti, Bora Bora). I never got to “do” the Pacific when I was a pilot, and it’s one of the only appealing places left on Earth for me. I’m always on Twitter. @CarlRackman please feel free to connect. I also have a website and blog at rackmanbooks.com and a lame Facebook page (because Facebook IS lame) but I prefer to interact on Twitter. Thanks very much for asking me to take part. It’s been emotional. Thank you for sharing. You certainly have a unique story. I’m still enjoying Irex and can’t wait to read more of your books. Espionage! I like you already. I’d love to be an expert in espionage, but as I understand it it involves a lot of lying, and I’m terrible at lying so I might just have to enjoy watching you be an expert at it. Jonah sounds like a fascinating book. I fully support sea monsters, though I’ll be disappointed if they turn out not to be real. I’m impressed by anyone who can write a good mystery. Also anyone who can lie convincingly. Either way, Carl’s books are impressive.